Strange Attractors is a collection of approximately 150 poems with strong links to mathematics in content, form, or imagery. The common theme is love, and the editors draw from its various manifestations—romantic love, spiritual love, humorous love, love between parents and children, mathematicians in love, love of mathematics. The poets include literary masters as well as celebrated mathematicians and scientists. "What, after all, is mathematics but the poetry of the mind, and what is poetry but the mathematics of the heart?" So wrote the American mathematician and educator David Eugene Smith. In a similar vein, the German mathematician Karl Weierstrass declared, "A mathematician who is not at the same time something of a poet will never be a full mathematician." Most mathematicians will know what they meant. But what do professional poets think of mathematics? In this delightful collection, the editors present the view of the same terrain—the connections between mathematics and poetry—from the other side of the equation: the poets. Now is your chance to see if the equation balances. Introduction. Romantic Love. Encircling Love. Unbounded Love. Index. Sarah Glaz is a professor of mathematics at the University of Connecticut and author of Commutative Coherent Rings and other books and articles in commutative algebra. She has had a lifelong interest in poetry, having served on the editorial board of Ibis Review, a literary magazine, and published several of her poems and translations in periodicals. As the song states, ‘Love is a many-splendored thing.’ In this book, mathematics is splendored in many ways that demonstrate the breadth and depth of interest and joy that it presents to those who love it. I recently acquired the book Strange Attractors: Poems of Love and Mathematics. I’m crazy about the poems in it. What a delighful collection! … The reader … does not need to know who Mandelbrot was, or how Venn diagrams work, or even the value of pi. She just has to understand that there is, at heart, a strong connection between math and poetry, and allow herself the pleasure of discovering how the two come together in these works. The editors did do a great job on the extras. I appreciate how they contextualized the book, offering a list of related books on mathematical poetry. And I frequently found myself consulting the author bios and publication information. If you are a mathematician who likes poetry, you are going to have a good time with this book. There’s some spectacular poetry here, and some actual math. It’s worth the dig. The strength of this anthology is that it looks at what both poets and mathematicians build with each other’s tools. Sarah Glaz and JoAnne Growney have put together an anthology that readers with interests in either camp will enjoy and want to share. Among the delights of this book, in addition to the poetry, are a substantive introduction, bibliographical resources, information about the poet-contributors, and about the mathematicians who are named in poems. … Mathematicians and poetry lovers (with at least some feeling for math) will enjoy the many treasures in this anthology. How do I love this book? Let me count the ways … The intersection of mathematics and the arts is nonempty and this volume masterfully describes the contents of that intersection. … The authors have included notes about the contributors and information about the mathematicians who are mentioned. This latter feature makes the book even more appealing to a wider audience. … This wonderful volume could be used in a number of ways — supplemental reading in a history of mathematics course, reading in a poetry or literature course. Or just read it for fun. These poems articulate clearly and poetically thoughts and emotions informed by arithmetic. The attentive reader also learns some math. I had never really understood the concept of the asymptote until reading Elizabeth Anne Socolow’s ‘Asymptote’ … That is to say, I might have understood the concept intellectually, but not with any feeling. Now, I get it, not just in my head, but also in my gut. And I know from my colleagues in the math department who speak with such passion about their work, that it cannot be only mental. … The editors of this collection have gathered an astonishing plethora of poems — from Dante through Shakespeare to Carl Sandburg and Shel Silverstein — that draw upon the metaphorical richnesses of math to make their poems sing. … Poetry and math, we discover, are not antithetical, as we might have supposed, rather there is a great deal of commerce between them. This collection is satisfying, provocative and robust. Explorations of connections between mathematics and poetry recently brought two poets to the MAA’s Carriage House Conference Center for an evening of readings. 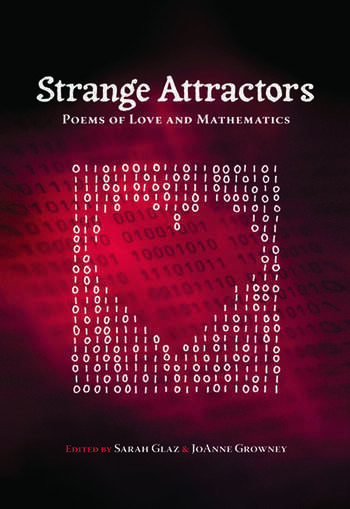 … Many selections came from the anthology Strange Attractors: Poems of Love and Mathematics. … The surprising interweavings of poetry and mathematics made for a delightful evening. Love and arithmetic. Well over one hundred poems, both past, classic, and contemporary, discuss these two subjects and how they have more in common than one would think. Strange Attractors is a fresh and original book of poetry, highly recommended. This international collection … can be recommended to every reader who loves poetry and mathematics and who wants to explore the way that mathematical ideas inhabit poetry. The combination of maths and love poetry might seem an odd mix. Despite loving maths myself, I was a little skeptical when I picked up this book … . I had no idea there would be so many poems suitable for such a collection, or that it would span so many centuries and include so many diverse contributors … not only can [this book] show people who are looking for poems to express love, the beauty of the language of maths, but it also might help explain some of the deep emotions mathematicians feel for their subject. It is a marvelous, lovely book. … This book is a collection of poetry by everyone from the masters to people aspiring to be one. It is good for the soul.